The artwork that is shown here is all original and individually painted; not prints of originals except where noted on small items like certain boxes and note cards, when available.. I do paint the same design upon ordering, but of course none of the work is ever exactly the same. This means that if you are interested in a particular feather or other piece, it is necessary to contact me to see if it is still available before you would, for example, pay with PayPal. I accept PayPal, bank cashier's checks or postal money orders. Established customers may pay with personal checks. I will always try to ship the next day after I receive payment. I ship United States Priority Mail for most items, as I have found it to be reliable and quick. I package everything very carefully so you receive it in perfect condition, but I think insurance offers extra protection at a very reasonable cost. Please email me for shipping costs and I will be as accurate as possible. Your satisfaction is guaranteed; if you are not satisfied with your purchase I will cheerfully refund your money if the artwork is returned to me in original condition. Please email me at gailsavage@joust.net with any questions or to purchase an item, or you can call the studio at 610-507-6024. From time to time I put one of a kind original art on ebay, and if you'd like to keep abreast of those my ebay id is poochild. You can find me on ebay by going to "Advanced Search", then "Search by Seller" and typing in poochild. If you add me to your favorite sellers list you will get regular updates when I offer something new. Some notes on framing: Feathers need some special handling, as they are very delicate and they are rarely completely flat. 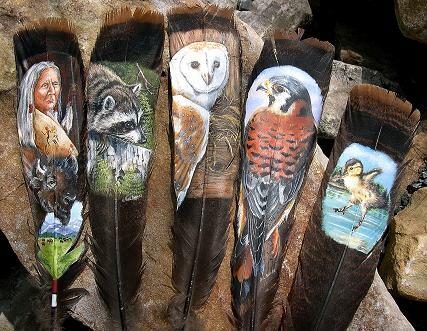 I mount my feathers by sewing them onto a piece of matboard cut to size, with a deckle-edge hand-made paper as kind of a "reverse mat." The feather is then carefully framed, with appropriate feather accents, in a high-quality wood frame that compliments the beauty of the painted feather. All artwork is ready to hang with a dust cover and hanging hardware. Thank you for visting; I hope you return often to see what's new in Savage Woods!